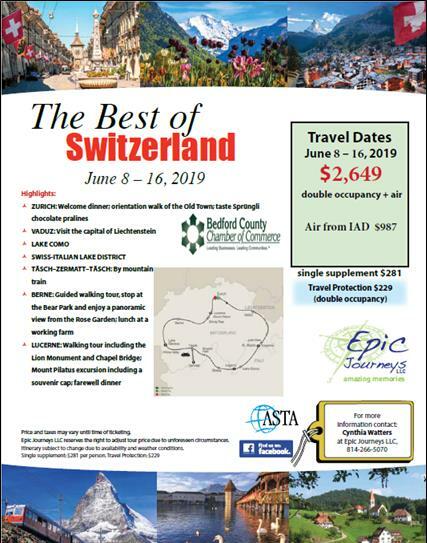 The Bedford County Chamber of Commerce is pleased to partner with Epic Journeys to offer an exciting trip to Switzerland in 2019. Due to a reduction in air fare, the price for this trip has been reduced. Highlights include visits to Zurich, Vaduz, Lake Como, Swiss-Italian Lake District, Tasch-Zermalt-Tasch by Mt. Train, Berne, and Lucerne. A trip to remember: an Epic Journey! Deadline to register for the trip is January 31st.